Back at the end of 2015 Mike Brampton and I had a conversation about climbing Everest. our conclusion was that summiting Everest might be best achieved using a ketogenic diet. I know nothing about extreme climbing or the culture which goes with it but it came as no surprise, via Mike, that they carb loaded and carb loaded and carb loaded. You know, sugar has its own partial oxygen supply built in to the molecule. No point trying to burn fat if there's no oxygen*. Understandable but, obviously, completely incorrect. I think Mike had been trying (frustratedly) to convert altitude folks to fat centred thinking for some years before this. *It's true that there is no point trying to burn fat under anoxia. But given some oxygen ketosis pays dividends. This fits in with Veech's concept of increased metabolic efficiency per unit O2 consumed when burning ketones and D'Agostino's discovery of an "unexpected" rise in arterial PO2 in rats gavaged with a betahydroxybutyrate/acetoacetate combination precursor, while they were breathing room air (PaO2 from 100mmHg to 130mmHg, pardon the archaic units). Very gratifying, even if completely different from the approach taken by Naked Mole Rats and their fructolysis. Naked Mole Rats appear to use fructose as their preferred metabolic substrate when exposed to both physiological hypoxia (which is common in their lifestyle) or complete anoxia under experimental conditions. It's irresistible to go and find out a little about why they might do this. 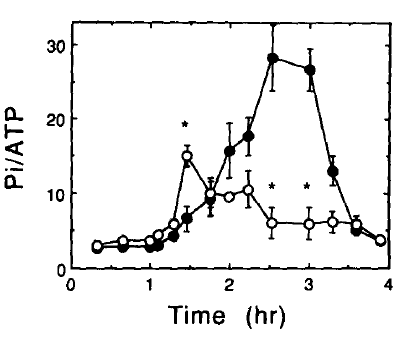 There was a lot of work done in the 1980s and 90s looking at ways of preserving liver cells under anoxia. I'd guess this was looking to improve the survival of harvested livers within the transplant program. So under fructose there is less ATP in the cytoplasm than under glucose but the phosphate level is even lower, giving a similar or more favourable ratio of ATP to Pi except at the 30 minute mark. So the next question is: Where has the phosphate gone? We have here two process which can be driven by an excess of protons in the cytoplasm over those in the mitochondrial matrix. Transport of Pi in to the mitochondria and synthesis of ATP. Which of these is most important to ensure cell survival is hard to say. It is even quite possible that it's neither and that maintaining an excess of protons outside the mitochondria maintains delta psi so defers the commitment to apoptosis or the occurrence of necrosis. Later changes which confirm the commitment to cell death are an influx of extracellular calcium in to the cytoiplasm. This is marked under glucose and stays within tolerable limits with fructose. I strongly suspect the metabolic decision making is being controlled by the pH drop and the Ca2+ influx is consequent to a mitochondrial decision as to how badly damaged the cell might be. But it's hard to be sure with the data we have in these rather elderly papers. There are two protons generated to acidify the cytoplasm. Now look at this step where pyruvate is converted to lactate. The molecules in the red oval are needed to form the lactate. The conversion of ATP to ADP releases them. So lactate causes acidosis only when the ATP generated during glycolysis/fructolysis is consumed... Obviously ATP depletion is common in anaerobic exercise or hypoxia/anoxia. Hence lactic acidosis shows under these two conditions. The Naked Mole Rat paper is very descriptive, with lots of experimental results but is light on insight as to hows and whys. I think the above scenario might well have explanatory power and might have been extended from the liver to the rest of the body in NMRs. which demonstrated that they (NMRs) appear to generate and use fructose as a coping stratagem for dealing with hypoxia or even anoxia. This is fascinating and leads back to research in the late 1980s, mostly looking at anoxia in liver or liver cells. I'm guessing that this liver work was funded to look at ways of improving the condition of transplant grafts. 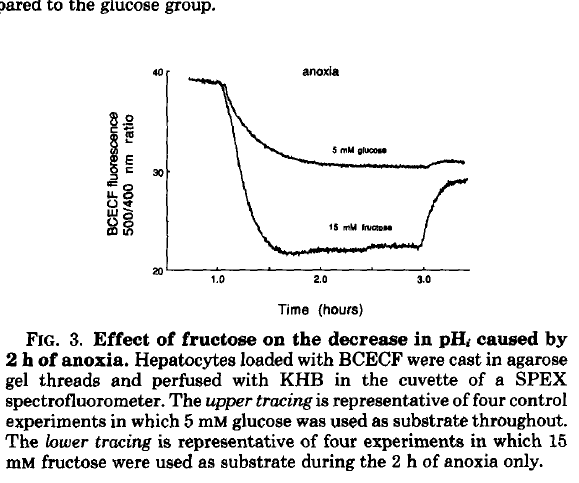 Fructose is significantly better than glucose for supporting anoxic liver cells, possibly something you might expect, possibly not. Perhaps in another post. Anyway. 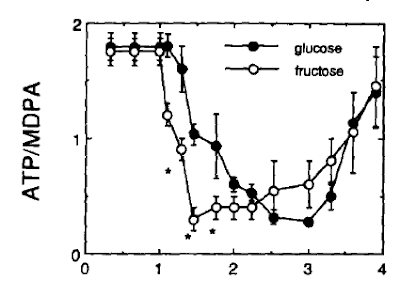 So I've been looking at why fructose is different to glucose and to do this you end up asking rather difficult questions about the upper sections of both glycolysis and fructolysis. Fructose enters the fructolytic pathway by being phosphorylated very rapidly to fructose-1-phosphate. Given a large enough supply of fructose this phosphorylation can deplete the ATP supply in a cell, most obviously in hepatocytes which bear the brunt of metabolising fructose. This takes place before aldolase generates the trioses which probably (or don't, in the case of fructose) control insulin signalling through mtG3Pdh and the glycerophosphate shuttle. If this initial ATP depletion by fructokinase is profound it is perfectly possible to take two "waste" ADP molecules and transfer a phosphate from one to the other. This generates one ATP and one AMP. The ATP is useful to the cell and the excess AMP is degraded to uric acid. The title of the paper is sneaky, it doesn't give away the answer! Nor does the abstract. If you don't want to read the paper, the missing link is NOX4. NADPH oxidase 4 (NOX4), if exposed to uric acid (present here from fructolysis induced AMP degradation), translocates to the mitochondria and starts to generate enough hydrogen peroxide* to down regulate aconitase, abort the TCA and divert citrate out of the mitochondria through the citrate/malate shuttle for DNL. This will not just affect fructose metabolism, acetyl-CoA from glucose, entering the TCA as citrate, will also be diverted to DNL. *The NOX family appear to be the only enzymes with no function other than to produce ROS, mostly superoxide. NOX4 is unique in that it always produces hydrogen peroxide. There is uncertainty if the "E loop" of the enzyme converts superoxide to hydrogen peroxide directly or if this is a docking site for superoxide dismutase, which does the conversion as an accessory module to NOX4. I think it is a reasonable assumption that the hydrogen peroxide generated by NOX4 will be what signals the insulin resistance induced by fructose, rather than RET via mtG3Pdh. Quite why fructose doesn't drive the glycerophosphate shuttle is a difficult question to answer. 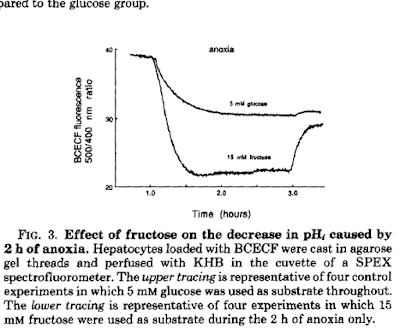 Obviously the aldolase products of fructose-1-P (fructolysis) differ from those of fructose-1-6-bisphosphate (glycolysis) but these pathways are very difficult to get at experimentally and I've not found any papers looking at what controls why dihydroxyacetone phosphate from fructolysis doesn't drive mtG3Pdh, but that appears to be the case. There are hints that some activation of the glycerophosphate shuttle does occur but NOX4 seems to be the main player. It might relate to the consumption of NADH in the conversion of glyceradehyde to glycerol and so reducing the need to decrease it using the glycerophosphate shuttle. Hard to be sure. So. Uric acid is the evil molecular link between fructose and metabolic syndrome via NOX4. And yes, yes, you can block metabolic syndrome using allopurinol to reduce uric acid production in rats but you have to give them a sh*tload of it. After that NOX4 might be considered evil or hydrogen peroxide is evil or aconitase is evil when it's on strike. Lots of drug targets available for molecular cleansing. My own concept is that there is the necessity to developing insulin resistance when fructose is available so as to limit glucose ingress to offset the ATP from that fructose ingress. If that is done by NOX4, so be it. The facility to deal with fructose by the generation of hydrogen peroxide is not random, it's not some accidental mistake perpetrated by evolution on hapless humans who munched on a few Crab apples or found a little honey. It is an appropriate evolutionarily response to a relatively common occurrence. The fact that uric acid mediated insulin resistance is common to alcohol metabolism as well as to fructose metabolism suggests that this mechanism is a general approach to dealing with a calorie input which takes priority over metabolising glucose. Developing a drug along the lines of allopurinol to block uric acid production, or an inhibitor of NOX4, or a hydrogen peroxide scavenger to avoid insulin resistance is simply trying to block a perfectly adaptive response to a reasonable dose of fructose. Mulkidjanian: Na+ pump or Na+/H+ antiporter? "Two recently published works independently noted the structural similarity between the NuoH and NuoN subunits and suggested their origin by some ancestral membrane protein duplication [13, 14]. Our analysis does not exclude the possibility that this duplication may have occurred even before the LUCA stage. In this case the initial NDH-1 form [proto-Ech in my terminology] had only one type of membrane subunit (the ancestor of NuoN and NuoH), which could function as a sodium transporter. The duplication of the gene would result in a different subunit, which improved the kinetic effectiveness of the redox-dependent sodium export pump (that participated in maintenance of [K+]/[Na+] greater than 1 in a primal cell) by facilitating proton translocation in the reverse direction". Bear in mind that none of us can be certain exactly what a given protein might have been doing based on these family trees of genes. My own view is that the pore was a duct to localise oceanic acidic pH tightly to an NiFeS hydrogenase within alkaline vent "cytoplasm" to allow the hydrogenase to reduce ferredoxin, the primary energy currency of the proto-cell. The power source is the pH differential across an internal FeNiS moiety within the hydrogenase, combined with molecular hydrogen as the electron donor to reduce ferredoxin and so, eventually, CO2. Given an antiporter sitting in a Na+ opaque membrane we can antiport a ton of Na+ out of the cell using a geological proton gradient to give us the result of a low intracellular Na+ concentration. Excess Na+ extrusion can be converted, by electrophoresis, to an elevated K+ inside giving the modern intracellular composition. In the early days the electrophoresis might not have been K+ specific, theoretically any positive ion other than Na+ would do. K+ is the long term preferred option. As soon as we leave the vent there is no free antiporting so we need to have a system which provides energy to generate a Na+ potential (buffered by K+ electrophoresis). The power available to do this becomes very limited in the absence of a geothermal proton gradient, when all that is available is the reduction of CO2 using H2, the Wood–Ljungdahl pathway. The Na+ chemiosmotic circuit then comes in to it's own as a system for combining small amounts of free energy in to units large enough to generate one ATP molecule. Recall how the modern pyrophosphatase Na+ pump requires the hydrolysis of four PPi to give one ATP via chemiosmotic addition. Until the advent of photosynthesis and the possibility of heterotrophy, all free living prokaryotes would have been autotrophic and living on a meagre energy budget. Labels: Life (16) Mulkidjanian: Na+ pump or Na+/H+ antiporter?